I’ve said that I don’t have a bucket list, but I can honestly say that I never, in a million years, thought I would find myself in a glider high above the earth. It wasn’t even on my not-a-bucket-list! In the past I have been very fearful of flying. In fact, I relied on small prescription pills and liberal doses of gin in order to get off the ground. Anxiety and fear ruined travel days, leaving me an exhausted mess in the arrivals area.I have always hated that I hated flying and so have been working on it for the past while. And quite successfully, I might add. 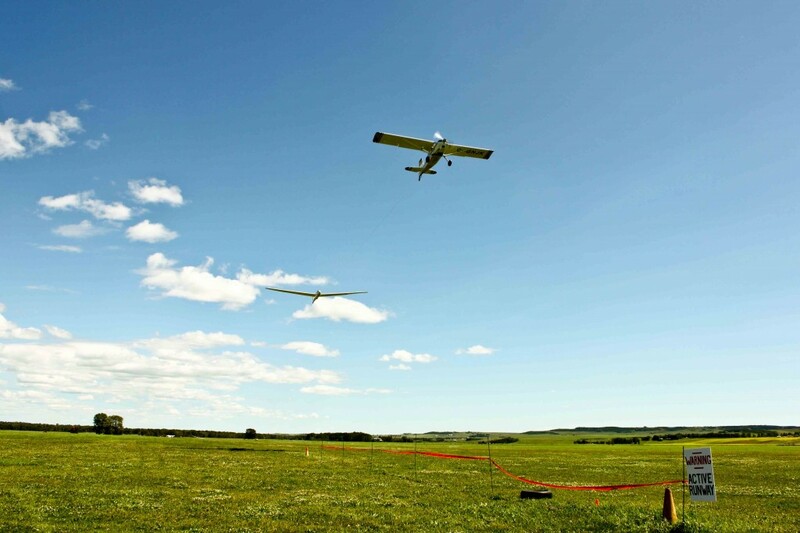 Auto-piloting home from work late last week I perked up on hearing that the Cu Nim Gliding Club just south of the city was holding a ‘Chicks Take Flight’ day on Saturday. 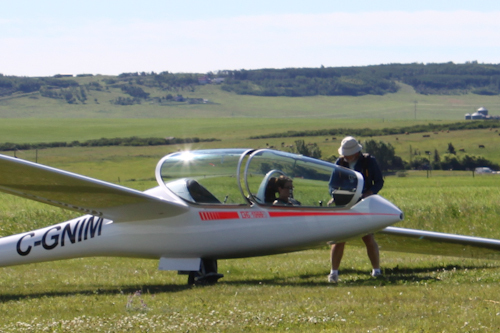 A chance to mingle with flying types, learn a thing or two about aviation, and an opportunity to co-pilot a glider. Would I have the balls? So I did what we all should do when we really want to do something but are afraid we won’t…I publicly pronounced I was going to do it. I told my friends, slapped it up on my Facebook page, sent out tweets and generally made sure that if I didn’t do it I would have to spend some time explaining why. I headed out to the airfield bright and early on Saturday morning to ensure that, if there was to be a crowd, I would get a flight. I wasn’t about to pump myself up for this and be let down due to bad timing and logistics! As one of the first to arrive at the clubhouse I quickly sign up for a flight, get weighed in (one of the first times in my life where it’s possible I am underweight for an activity! ), and head to the hangar for ‘ground school’. I’m a little bit nervous so I listen intently and take copious notes during the ‘Airmanship’, ‘Meteorology’, and ‘Flight Theory’ classes as though the learning I’m doing is absolutely critical to the aircraft staying in the air. A quick trip to the flight simulator and I’m ready to go! Shuttling out to the airstrip from the hangar I realize I’m not as nervous as I thought I’d be. I’m more excited than nervous; feeling daring, and brave, and oh-so-proud of myself. Although I do notice that the breeze is picking up and wonder how that will affect the flight. Soon I am greeted by some of the other women returning from their flights; their huge smiles clear evidence that I am in for a great ride. Unanimously they tell me how fabulous it is up there, how they can’t wait to do it again, and (most important to me) how competent and kind the pilots are. Soon enough Alan comes over, introduces himself, and escorts me to the glider. Strapping a parachute on, I climb into the front pilot seat, my nerves climbing just a little bit also. 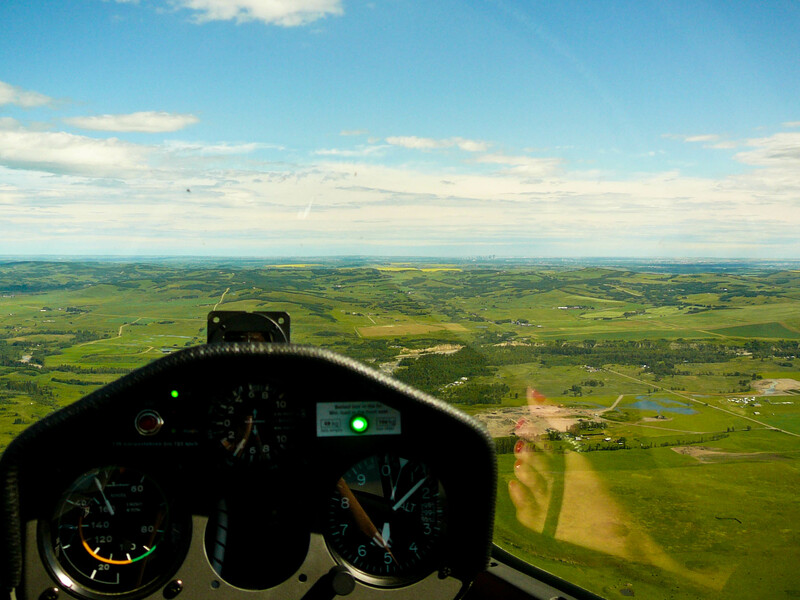 Alan takes the time to describe all the instruments – altimeter, air speed indicator, control stick, tow rope release, rudder paddles – but it all blurs together and sounds like the teacher in Charlie Brown to me. I’m not paying attention as I’m thinking about what I’m about to do and remembering back to all the fear I used to bring with me. Jumping in behind me Alan quickly secures the canopy, radios to the tow plane, and we’re off! Within a few seconds we’re airborne, being pulled behind the still grounded tow plane like a kite running behind a four year old. I watch as the small plane ahead also gains air and we start the dance up to 2000 ft; he dipping and swaying in the wind as he coaxes us up to the next level; we follow along like a good dance partner, staying steady and waiting for our turn. The radio crackles and Alan tells me he’s going to release the tow rope. I realize I’m holding my breath as the rope flies free and the tow plane banks sharply to the left. My breath is stuck inside me released only in small squeaks as we bank sharply to the right at the same time. Nothing but the sound of the air rushing by the cockpit. I am transfixed by the feel of it under me. I watch as the wings flex their way through it. I can see forever; mountains, city, hills and towns. I relax into it, grab the control stick, and pay attention as Alan teaches me how to glide through the air. It’s touchy, and responsive, and scary. When he asks if I want to take it on my own all my bravado falls to the earth and I tell him ‘not this time’. I don’t want to ruin the moment by being anxious. I want to enjoy every second and feel comfortable. We swoop and twirl a few more times before I can hear the last song being played and realize we must heed the call of gravity and return to the airstrip. And then I’m one of those women with a huge smile on my face encouraging others to give it a try. In the end I was as impressed by the club members as I was by the flight. Over and over I witnessed members introduce themselves, get everyone all the information they wanted, and generally make sure everyone had a great time. 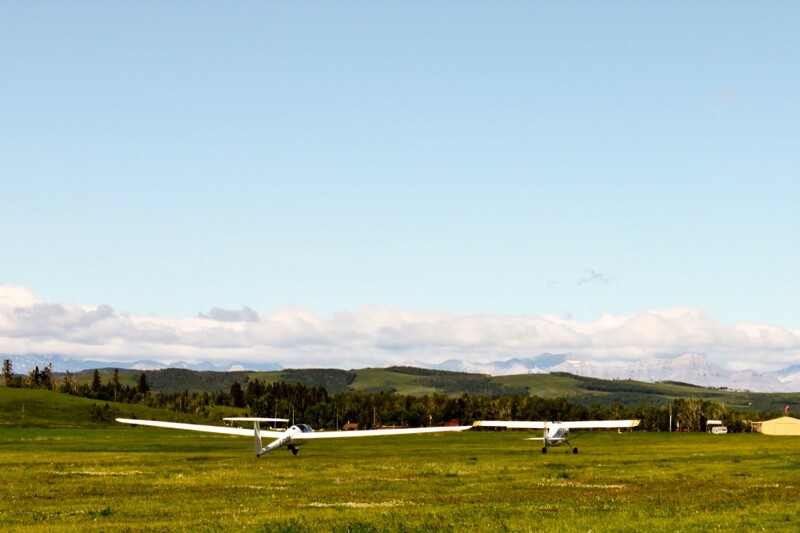 This community-focused, all-volunteer club takes care of all the business of flying; tending the aircraft, mowing the airstrip, caring for the hangar, maintaining the club-house, barbecuing the hotdogs, and watching out for each other…all for the love of gliding and soaring. Thanks to all of you that made sure I had such a great day! 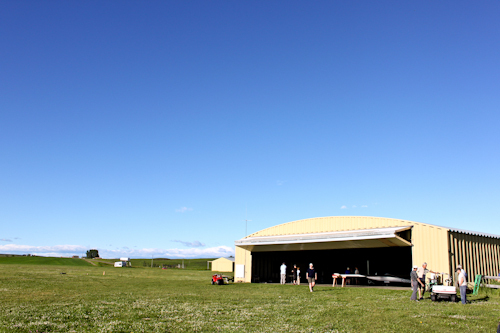 Cu Nim Gliding Club didn’t pay me to say all these fabulous things. In fact, they didn’t pay me at all, nor did they know I was going to write about them. They really were just that fabulous. 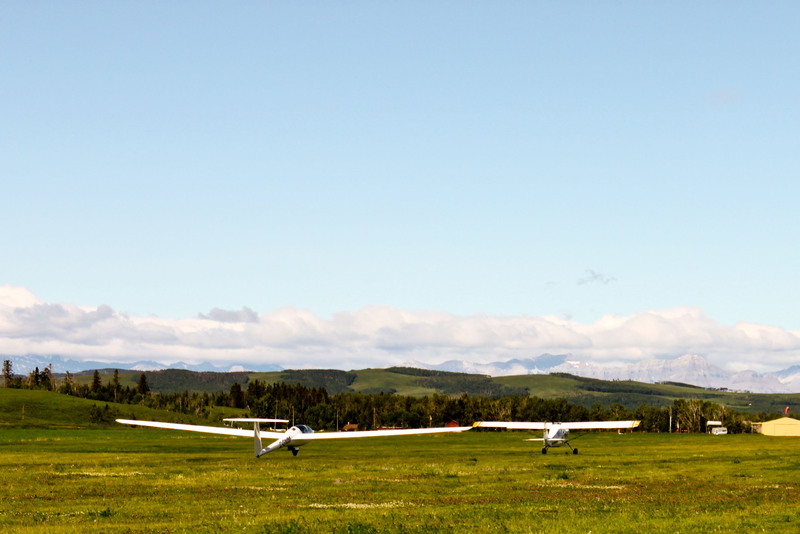 If you’re in the Southern Albera area, and are interested in gliding, I encourage you to check out their website – they do introductory flights all the time. Announcing the winners of the The$100 Startup book giveaway! Congratulations to Ali in Germany and Arti in India – I’m not sure that two readers who live farther away could have won!! I’ll contact each of you by email and get your mailing addresses. I’m interested to hear what you think and how $100 could change your lives. That looks amazing. My mom went skydiving once and that seems crazy. I think this gliding thing looks like fun though. Gillian, oh my goodness. What a beautiful, poetic description of flying a glider! 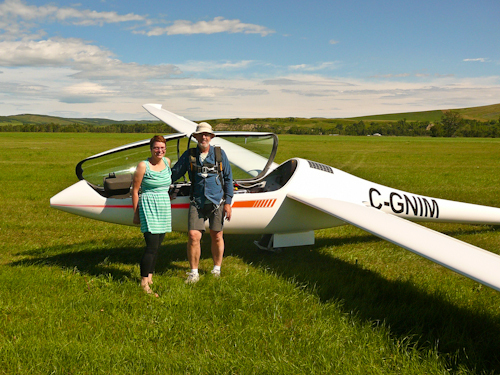 I love that you call the towplane and the glider “dance partners!” And I’m so happy for you that you are succeeding in your goal of beating your fear of flying. This is really, really beautiful. I would have enjoyed reading it even if it wasn’t about the event I helped organize. :) I’m so glad that you had such a great day, and am very flattered you think we were fabulous! Reactions like this make all our work worthwhile, and are the reason we do these public outreach events. Thank you so much for writing this. I’m glad you like it Erin. And thanks for pointing out the pics! “Do the things you fear and death of fear is certain” Ralph Waldo Emerson. I’m so glad you enjoyed your experience at our club. We all were so thrilled that so many women did something they’d never thought possible; your account is so expressive and beautiful. ‘Well done you’ for working on your flying fear. It takes moxie and determination to face and overcome the sticking points in life……it sounds like you have buckets of that. Thanks again for your post, Gillian. And we’d love to see you out at the club again if you’d like to come for a visit???? I love the quote Jo, thank you. I’m glad you like the writing. We would like to publish your blog in our soaring journals: ASCent and Free Flight. Thanks so much again. Come visit again..
I’m glad the day was a success by your standard too Judy and I hope you all decide to do it again. I would be happy if you used my post in your soaring journals – could you send me a link if there’s an online version? Thank you. No we don’t have our journals on-line but perhaps we could make arrangements to get you hard copies. May I keep in touch via your email address @one-giant-step.com? I would like to know how we can get them to you. Keep up the wonderful work. Your writing is so very inspiring! I went gliding about 400 years ago and it is still a memorable experience in the front of my diminishing memory cells.We were pulled up by a huge winch a few hundred yards down a farmers field.We took off like a rocket launch and when the pilot released we were pointing straight up at the sky.Very thrilling!The flight was over before I knew it.Thanks for reminding me of that glorious occasion!! I read about the winch tow…and was grateful we didn’t use it that day. I never thought about the logistics of releasing the tow rope at just the right time! Glad I could evoke some memory from that rapidly fading memory of yours Ron! I’m so glad that you enjoyed your day at CuNim, and appreciate your kind words. You write very beautifully. You captured the essence of the dance of flight, but I’m also happy that you pointed out the importance of people. Being part of this soaring community is part of what makes the sport so great. You’re welcome to come back and visit anytime! As I said Shulamit, the community was impressive. You have a great group of people there! 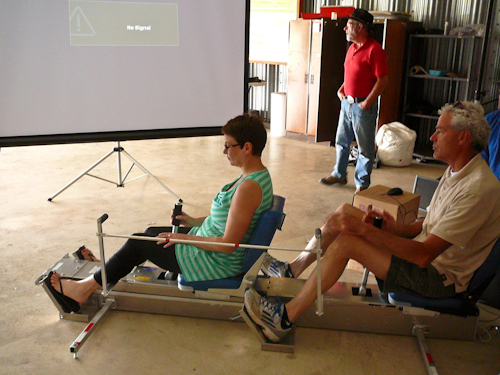 I gave my husband a glider flight for Christmas one year and remember well how well he loved it. Good for you for confronting your fears and for having such a good time doing it. Leigh recently posted..Which One of the Nine Travel Types Are You? I bet he loved it Leigh…I can’t believe you didn’t try it yourself! Its wonderful how you enjoyed something which was not in your plans… Though I would never try something as adventurous as this as I too am scared of heights!! I don’t have a fear of heights Arti, but I have heard that gliding does not instill that fear. Remember, though, that I did have a fear of flying…perhaps you can overcome it? I have sent the book off to you – I hope you enjoy it! And yeah, forgot to mention… Thanks for the giveaway… I have sent across my mailing address to you. Congrats on facing your fear so head on. Really proud of you.